English tours depart to 10.00, 11.00, 12.00, 13.00, 14.00, 15.00, 16.00, 17.00, and 18.00. French tours: 10.30, or 16.30. Spanish tour: 11.30, 13.30, 15.30, or 17.50. Italian tours: 18.30. Russian tours: 12.05. Catalan Tours: 12.30. Tours of the Palau de la Musica are available all year. We are comparing Palau de la Música catalana Tour Prices from leading ticket suppliers and Try to find you Cheap tickets prices on the market. A UNESCO World Heritage Site since 1997 the Palau de la Musica Orfeo Catala is literally ringing with the artistic flair of renowned architect Luis Domenech I Montaner. Aside from Gaudi, Montaner was one of the leading designers of the Art Nouveau Movement in Barcelona. On this 45-minute guided tour you will hear the fun facts behind Palau's construction and use throughout the 1900's. Your will begin your tour at the Palau's box office and follow a knowledgeable guide to the original rehearsal room of the Orfeo Calata. Rehearsals have been taking place in this hall since it opened in 1905. The tour will continue to the Foyer, Modernista Hall, La Sala Luis Millet with its grand stain-glass window, and the magnificent Concert Hall. You also gain access to the Concert Halls 2nd floor where you can see the stunning skylight up close and enjoy a tune played from the keys of the Palau's organ. This is a compact and convenient tour of la Palau which will give you a glimpse of the history and architectural features of the modernisme era and a taste for Catalan music, without taking up your entire day. You also get to skip the queue so you'll have a little extra time to can enjoy a coffee on Las Ramblas before joining your selected tour. 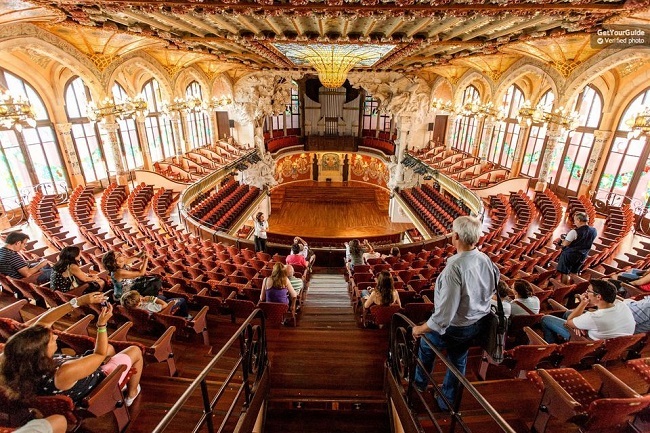 A guided tour of Palau de la Musica is ideal for lovers of the arts, see inside an iconic building of the Art Nouveau and Modernisme era and learn about the musician and performers who stood upon the famous stage. Ideal anyone with only a short time in the Barcelona or for disabled visitors. Your Experience With Palau de la Música catalana Tour? Visit a UNESCO World Heritage Site and discover the most famous work of 20th century Catalan architect, Lluis Domenech I Montaner. Benefit from skip the line entry and learn from the knowledge of your expert bilingual guide. Marvel at the iron and goldworks in the Grand Concert Hall and enjoy a live performance on Palau's organ. Get access to sections of the Palau which are usually off limits to guests. What Palau de la Música catalana Tour Includes? 45-minute guided tour in English, Spanish, Italian, French, German, Russian, or Catalan. Entrance to the Palau de la Musica with access to restricted sections. This tour is available in a number of languages, so, if your preferred language is not English you can check in advance when a tour in your native language will take place. Travelers Reviews about Palau de la Música catalana Tour? Viator and TripAdvisor share over 120 reviews for this compact guided tour. The average score from these sights is 5 out of 5. Many positive reviews and an average score of 4.7 has been left by Get Your Guide users. Comments agree that Palau is a very beautiful building which has been well maintained. Travellers say that the tour guides in Palau are very helpful and knowledgeable. Most tickets are fully refundable up 7 days before scheduled tour however charges may apply to cancellations made less than 7 days in advance. Some policies are more flexible and allow cancellations to be made without charge up to 24 hours prior to departure, please check before making your booking. Children aged 0-10 can enter free of charge, student and seniors can purchase discounted tickets. Please bring a valid ID and confirm the time of your tour, due to availability tour times can change. Camera ARE permitted inside the theatre during the tour. Meeting Point: Palau de la Musica Box Offices, located on Carrer Palau de la Musica, 4-6, Central Barcelona.